Bristles made from longer lasting, slightly irregular tapered end PBT, rather than nylon. PBT is more durable and less water absorbent than nylon, hence less likely to harbour germs. Curve shaped handle that is more comfortable to hold. Handle made from MOSO bamboo, which is not the bamboo eaten by Pandas. Bristles are pressed in rather than glued. BPA free handle and bristles. Bamboo is one of the fastest growing plants, where as the petroleum used to make plastic is a finite and polluting resource. Bamboo is able to be buried or composted and will return to organic matter in the soil, while a plastic toothbrush will sit in the environment for hundreds of years before it disperses into synthetic contaminants. Plastic toothbrushes are not able to be recycled through household recycling systems, so most end up in landfill. 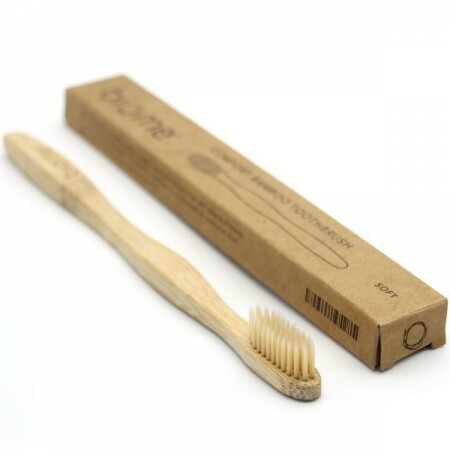 Please note that Biome does offer a complementary service in our stores of taking plastic toothbrushes for recycling. 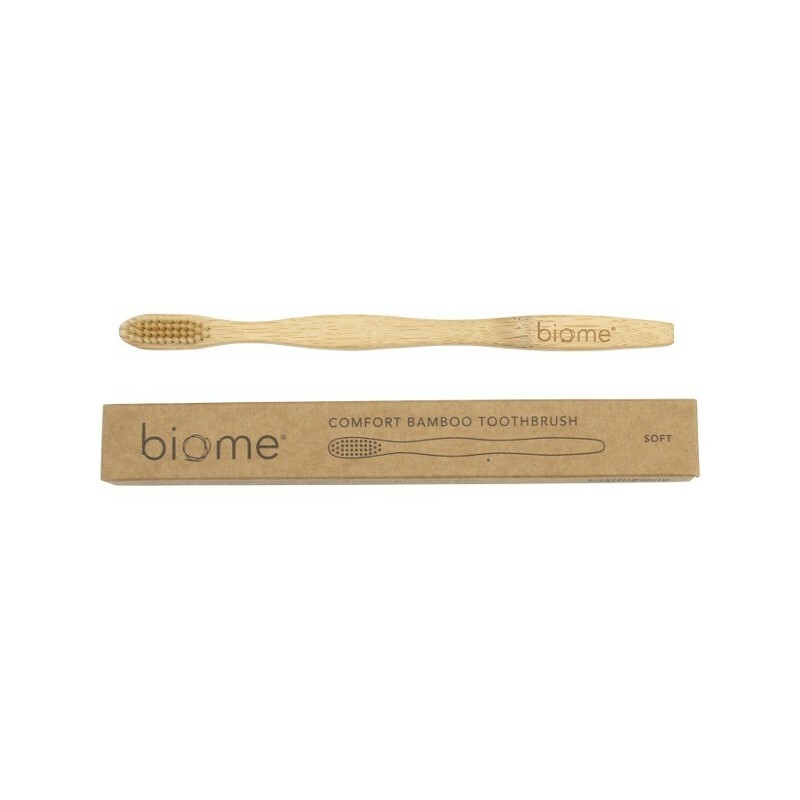 100% plant-based plastic bristles are much softer and only last for a few days or weeks. It is exciting that these plant plastic solutions are being worked on, but we also see a role for long wearing bristles on a brush that only needs replacing every 2 to 3 months. Bamboo toothbrushes consume resources and generate pollution in their production and transportation around the world, and thus it is still wasteful to make toothbrushes to be replaced every few weeks. If we can convert millions of people to using bamboo handle toothbrushes instead of plastic by offering bristles that meet performance expectations, then this is a massive positive environmental outcome. We will continue to support and search for compostable bristle solutions. PBT (polybutylene terephthalate) is a polyester compound. Nylon bristles are more flexible but they a water-absorbent and more easily deformed. Therefore, nylon bristles are generally made more thick to be longer lasting, but that can make them more harsh feeling, unless the ends are rounded. Most bamboo toothbrushes on the market use Nylon 6 bristles. 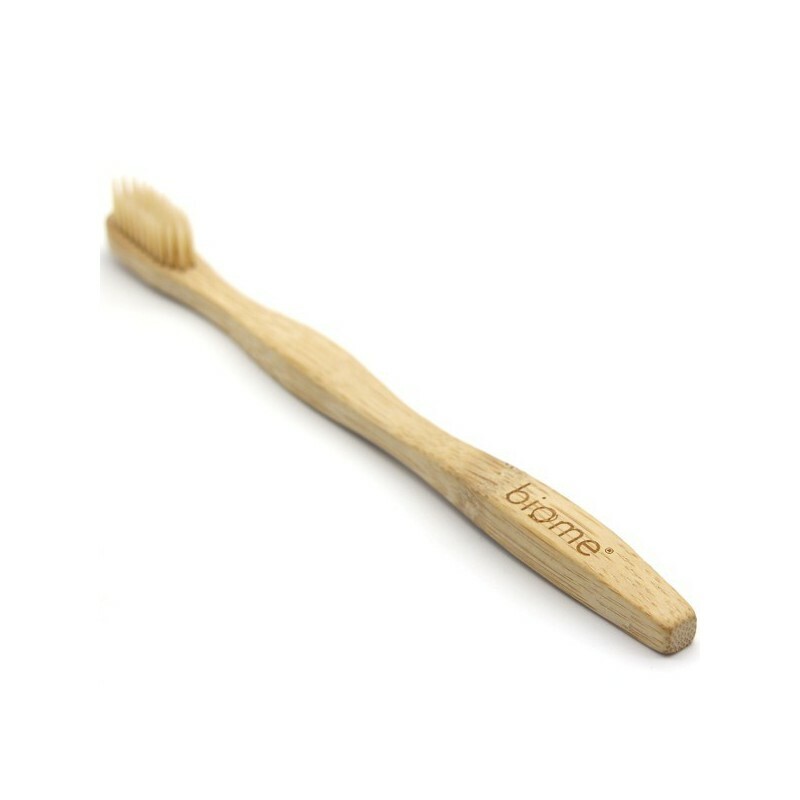 Biome's Medium bristle toothbrush uses Nylon. PBT bristles have a tapered needle shaped end to make them more thin and flexible and better for reaching between teeth and gums. Allow to air dry between uses, do not encase. Otherwise care for your brush as you would a plastic toothbrush. Replace every 2 to 3 months or when the bristles have frayed out of shape. Consider a bamboo travel case for storing on the go. Bristles can be removed with small pliers before composting. They are too small for recycling so need to go in landfill. This is a tiny amount of plastic compared with a plastic handle brush. Packaging box can be recycled. 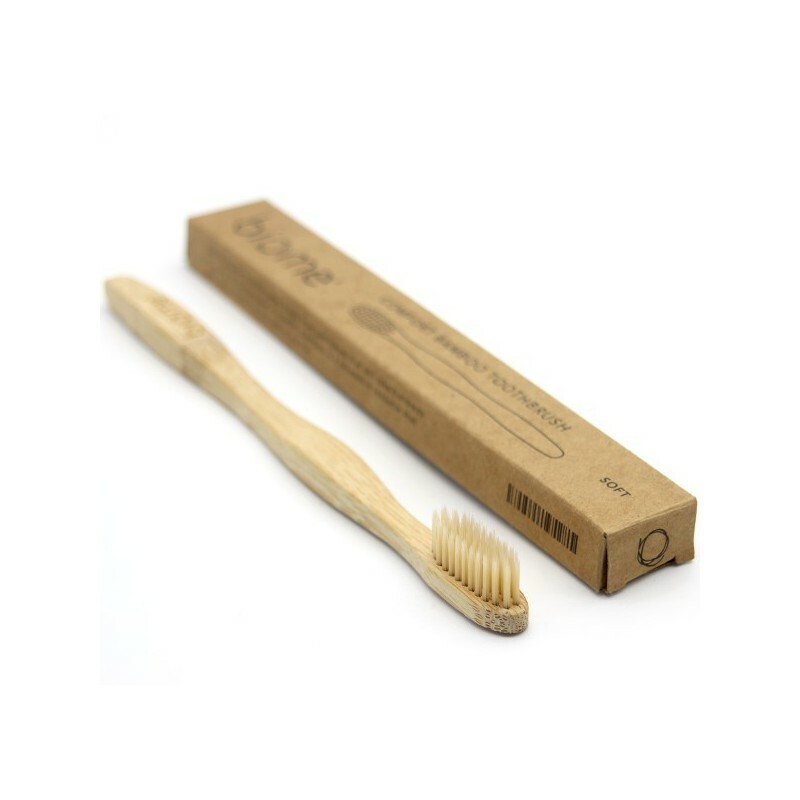 Nice feel and shape - the best alternative to conventional toothbrushes! Feels great gives a good clean.